When it comes to serving their owners, commercial garage doors hold equal importance in the life of their owners just as residential garage doors. Used on regular basis, commercial garage doors are subject to a lot of wear and tear, leading to the failure of one component or the other. It is important that regular inspection is done in order to detect any possible faulty component to avoid any kind of inconvenience in the future. This is extremely important as it disrupts the working of your office, making even your employees suffer. If your garage door fails to operate smoothly or does not wants to operate at all, it is a strong indication that you have a power failure. If one has the knowledge for the same, he can fix the issue himself but if one has no idea about it, it is recommended to take professional help only. Garage doors have sensors installed to them which prevents them form falling onto something. When they fail to operate, they can pose a great threat to your vehicle and employees. A seriously damaged sensor can make the door work in opposite direction and even refuse to open or close completely. If the track is broken or damaged, it will be impossible for you to operate your commercial garage door. Faulty rollers or rails are the prime reason for a track failure but at times the metal track is also broken. To avoid such kind of scenario, it is important that you get it inspected to detect any possible fault coming in the future. Since most of the commercial garage doors are pretty heavy, it requires great amount of force to move it. This makes the springs and cables to work a bit harder to operate such a heavy garage door. For this, they need regular care and maintenance and if one tends to ignore the same, is faced with issues like these due to a faulty spring or cable. 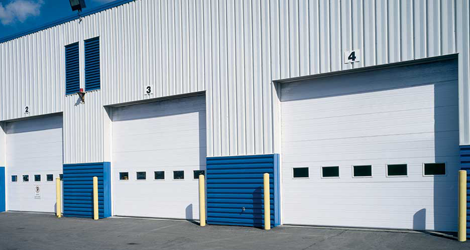 If you are facing any commercial garage door issue or are looking to repair, replace or get it inspected, feel free to contact Value Garage Doors in Mississauga. Our professionals deal with commercial garage door issues on regular basis and know how to solve such issues at the earliest through our emergency garage door services. Call us to know more about our services or to request a quote!